We are continuing our Living Hope Series through Peter’s second letter, specifically tailoring this study to utilize 2 Peter as a workshop of sorts, with an emphasis on learning & equipping ourselves for personal study of the Word. This is a great way to connect with other women in our church while diving deep into the scriptures together. Brooke & Lacey share in a desire to cultivate a culture among our ladies that seeks to be women of the Word. This 8-week study will kickoff Tuesday, Feb 20th and we’ll have two options: a Tuesday morning gathering at 9:30am and a Tuesday evening gathering at 7pm. Childcare will be provided for the AM gathering only. 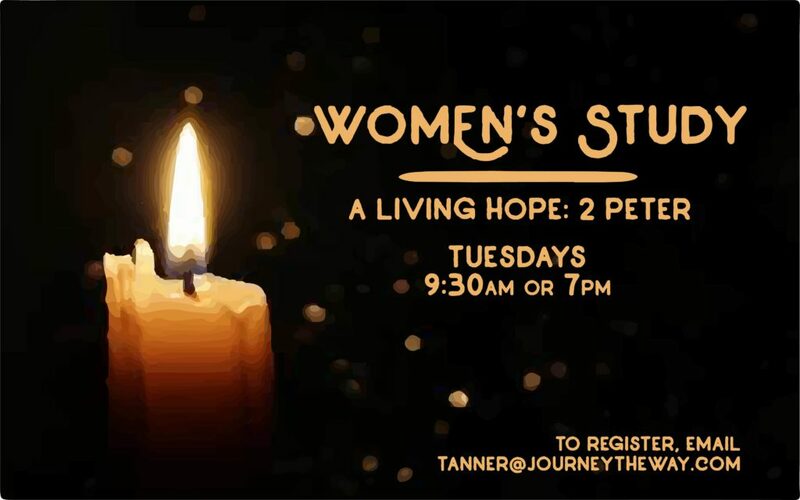 This study is open to all ladies, whether or not you attend Journey The Way. When registering, please indicate which session (morning or evening) you plan to attend, and if you will be needing childcare.